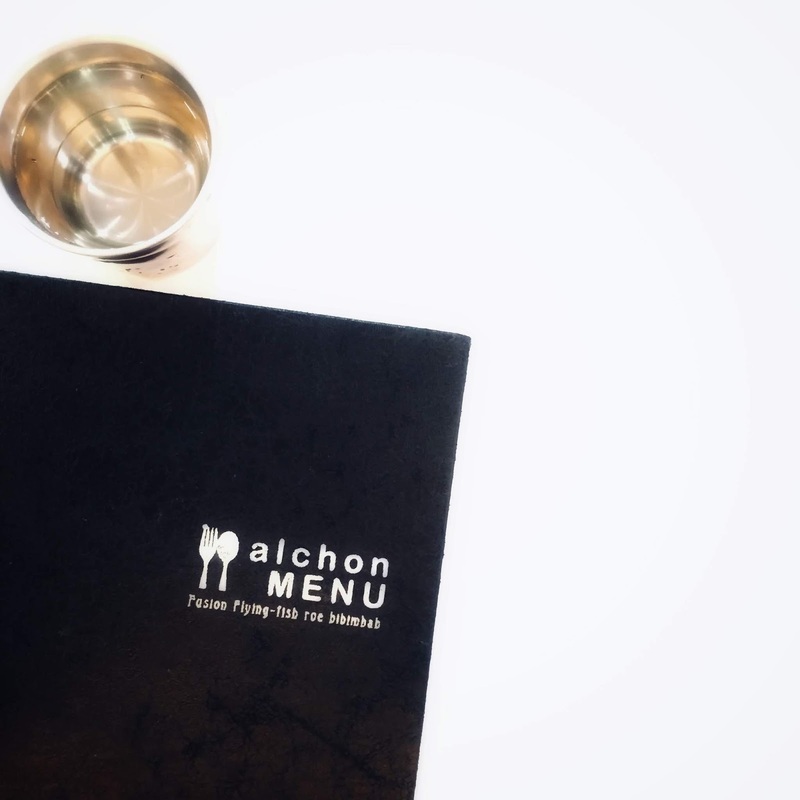 If you have read my previous post about this Alchon restaurant at Ehwa University, Seoul. (click here to read more about it in my previous post ) , I did mention it was our ( my #gengmakan) favourite restaurant since the first time I and my #gengmakan visited Seoul. The reasons I and Hanis always repeat to visit South Korea because of Alchon. On my trip to Korea this year 2018. 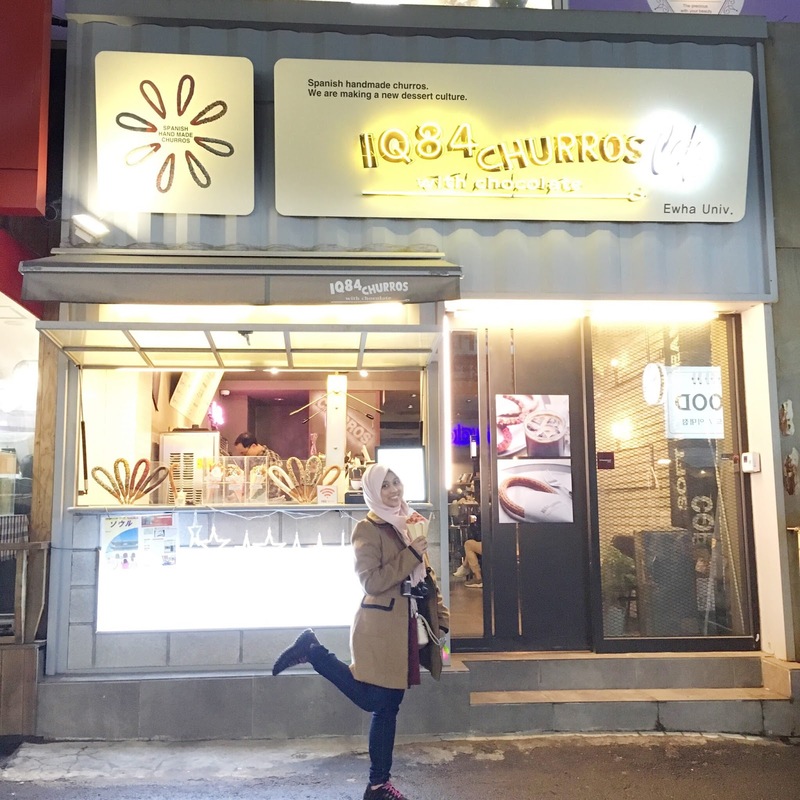 We ( Me, Hanis and Syira ) already planned ahead, the first thing that we should eat once arrived in Seoul was Albab at Alchon Ehwa University. With an excited feeling. We entered and choose the seat. Alchon also has made changes. You need to do a self-service ordered. What makes us shocked was the menu listing when suddenly, Syira and Hanis noticed that the ingredients they use in the Albab contain pork sauce. All this time, seriously we did not notice about this AT ALL. 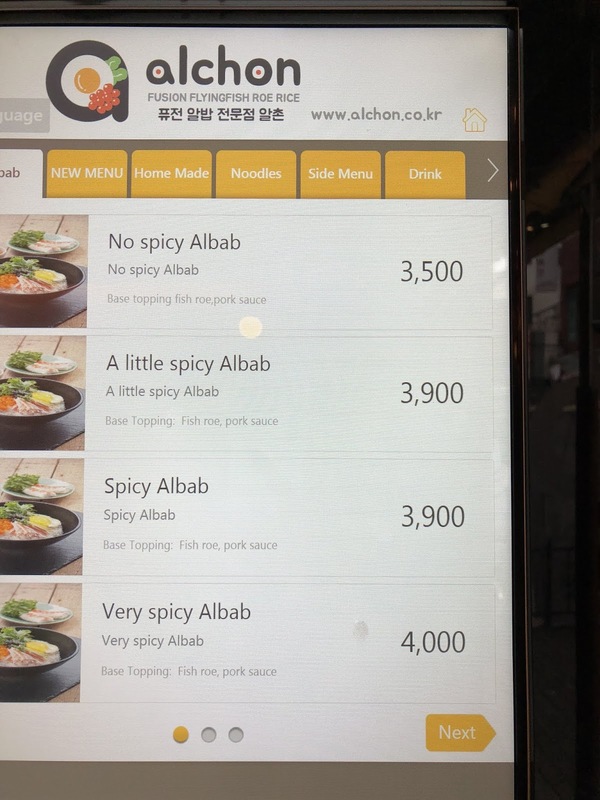 When we first time visited Seoul, our tourist guide taught us to ordered Albab. He taught, " If you wanted to order, tell them, NO GOGI ". We knew that GOGI means MEAT but we did not notice about the Pork Sauce. After we saw the ingredients in the menu. What should we do? Of course, without a further ado and sad feelings. We exit the restaurant with a heavy heart. But, Alhamdulillah we notice about it earlier. So, here. I'll share with all the Muslim Travelers. The Alchon restaurant is using Pork Sauce in the Albab. This information was based on what I saw. If anyone of you knew more details about this Albab ingredients. I really need you to share anything regarding this in the comment column below. Hope this post gives you an important information. Especially, for Muslim travellers. So, where are we ( Me, Hanis and Syira ) going to eat? Can anyone of you make a guess? Hihihi.. Stay tune for the update of my Korea Trip 2018. Ala.. dah kena cari tempat makan baru ye sis.. Mujurlah tertulis di menu..
itu lah mmg cari tempat baru dah lah mmg target nak makan itu . Tapi,alhamdulillah lah jugak perasan menu nya ada ingredients itu kan . kalau tak hmmm tak tahu lah. Guess you went to Gosame right after? Because you were around Edae and that's the only restaurant that is quite famous among Malaysians/Singaporeans/Indonesians. By the way, sedih sangat Alchon guna pork sauce. Baru nak cuba bila pergi Korea even tak tahu bila lagi nak pergi. Tapi, baru baru ni macam ada je baca yang Alchon boleh makan lagi. Tapi that one orang tu mentioned yang dekat Kondae. hihihi... nope , we did go to Gosame but on different day. Sebab Gosame another restaurant yang a must pergi bila dtg Seoul. Aww, that's sad. But at least you guys manage to realize it earlier. I bet you guys are going to either Gosame, as it is near Ewha or the ayam place near Gyeongbok Palace. Tak ingat nama kedai lol. yup sad but true luckily we managed to notice it earlier. hihi... nope we went to other restaurant just near with Alchon. We did go to Gosame sebab that one restaurant a must eat everytime dtg Seoul . But, we go on different day. hihi. So sad. Rasa tak best kalau ke Ewha tapi tak boleh makan Alchon 😭😭 Tapi okaylah daripada kita tak tahu kan. Huhu. Thanx for d sharing nad.. bayangkan if ada di kalangan kita yg oder kat situ tp tak perasan ada sos emm emm tu.. aduhhh.. btw , benda ni patut di viralkan..sbb terlalu ramai yg ke sana dan tak peka pada pemakann yang ada d sana.. gud job nad! Thank you. Nad just try cuba sampaikan info mana yang Nad boleh tolong. sebab dah baca menu tertera depan mata kan. So, i think i need to share this on my blog. Since, Nad ada story pasal restaurant nie before on my previous post about Korea. Thank God realize earlier, reading this like reading a snippet from a drama, that moment when 'So, where are we ( Me, Hanis and Syira ) going to eat? Can anyone of you make a guess?' its like im reading a drama based story. Huhu. I cant guess anywhere cause where on earth is Ehwa U is out of my radar expertise. haha. Ye keeee~ Eyqa mcm drama ? Rasa kelakar pulak bila Eyqa ckp mcm drama bila baca part tue. And someone I knew went to Alchon today & they still hang the Halal sign at its door. Huhu. But memang tau pasal Alchon dah takleh consume; a friend study kat EDae tu bagitau. No worries, Yangpang Chicken ada. Hihi. 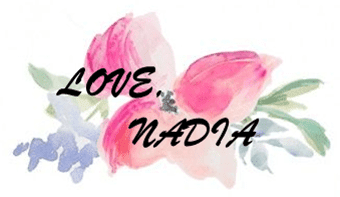 Thanks for sharing such crucial info Nadia.